Canon EF 400mm f/5.6 L lens and EOS 1D Mark II. ISO 400. Evaluative metering -1 stop set manually: 1/5000 sec. at f/5.6. 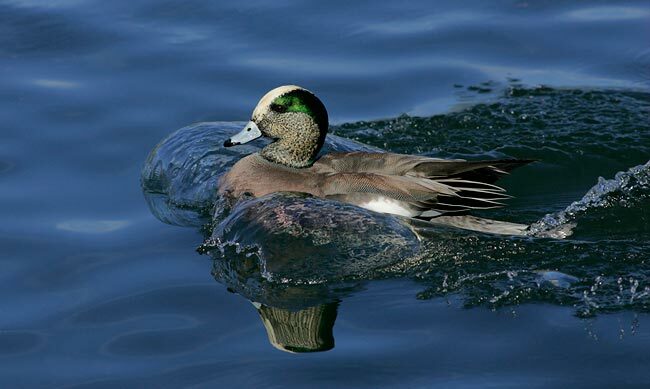 With all the small patches of white on the drake wigeons and the dark blue water backgrounds we teach folks to underexpose from 1 to 1 1/3 stops to avoid burning the highlights. I used central sensor only AI AF while handholding the toy lens to make this image. The newly revised Bosque Site Guide will be e-mailed late this coming Tuesday to all those who have purchased the guide previously. If you own a copy and do not receive the update by Wednesday, please e-mail us and request same as some servers block various attachments and PDFs and some folks may have forgotten to notify us of their new e-mail addresses. The revision will describe the photographic experiences that I enjoyed on my recent trip: November 13-29, 2005. 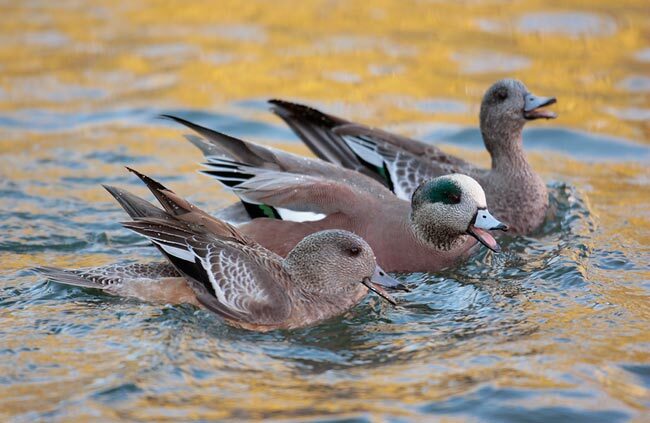 Most importantly I have chosen to reveal the location of a magical pond where American Wigeons can be photographed easily and at close range. Those who wish to purchase the Site Guide for the first time can send a check made out to "Arthur Morris" for $50 to us at PO 7245, Indian Lake Estates, FL 33855, or send us a Paypal via or, if you have trouble with the link, you can do the same via any Paypal link on the web site. In either case, please indicate a payment of $50 for the Bosque Site Guide. Thanks! Free lifetime updates are included at no charge. Evaluative metering -1 stop set manually: 1/1600 sec. at f/8. I often choose to stop down to f-8 for flight and action photography when possible. That is why I was stuck with ISO 400 here despite the sunny conditions. "With your Bosque guide in hand I spent a day and a half at the Refuge. It was a fantastic experience and your guide was invaluable. Thank you!" Canon EF 400mm f/5.6 L lens (handheld) with 1.4X II TC and EOS 1D Mark II. ISO 400. 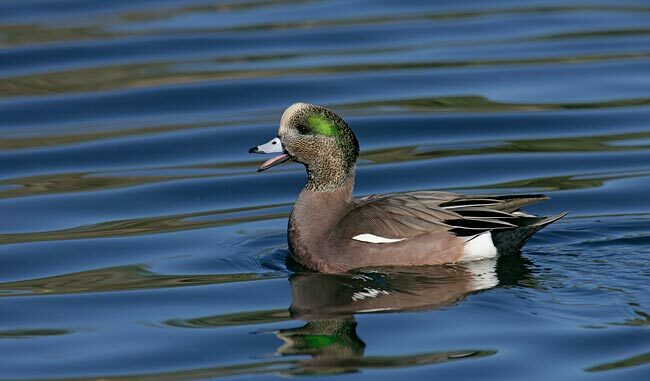 This is "Grandpa," a genetic morph drake American Wigeon. 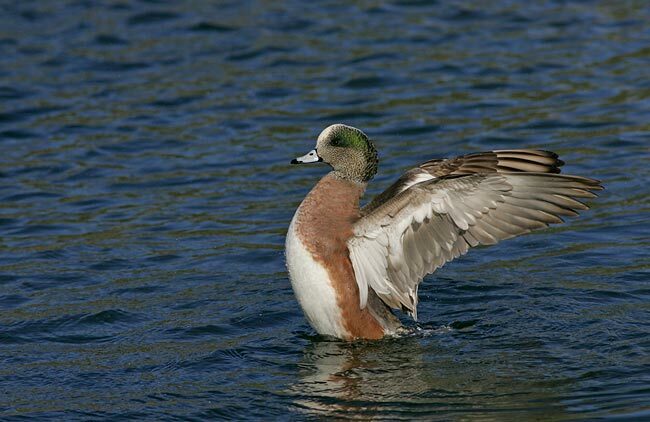 Most drake wigeons have gray faces with lots of streaking, while this bird and others like him have a rusty-cream face with little streaking. 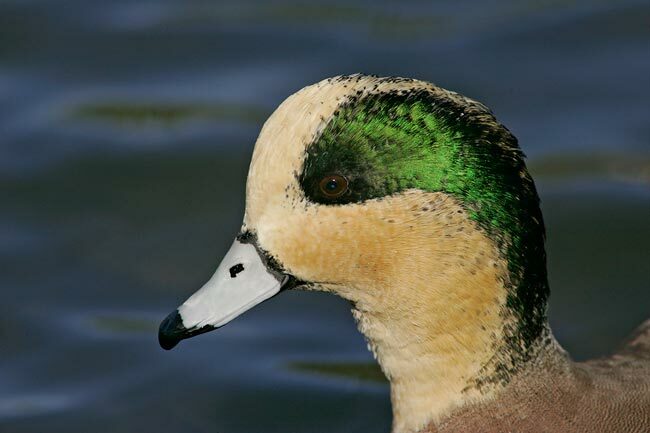 I often use the 400 with the 1.4X TC to make head portraits at the wigeon pond. Jill Conrad, who has worked closely with us for years to ensure that we get all the great Wimberley products in your hands on a timely basis, is proud to announce that her new web venture Photographer's Gifts.com is up and running. With the holidays fast approaching, you will surely want to check out her offerings at: www.photographersgifts.com All of us here at BAA would like to wish Jill the very best of luck with her new endeavor. Evaluative metering -1 stop set manually: 1/2000 sec. at f/8. 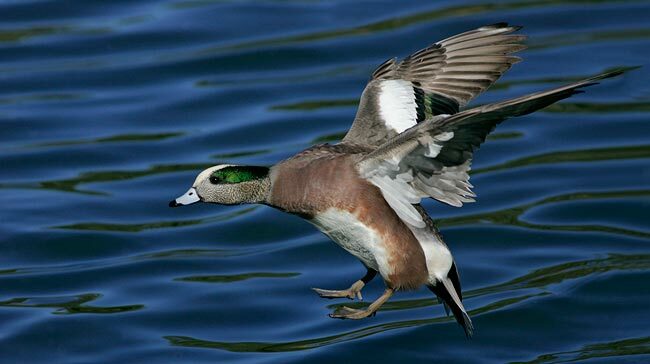 For the ducks that flap after diving for food I use and recommend 45-Point AFPS. I had the pleasure of meeting Barney on my Galapagos trip last year. (Barney is not related to the famous old-time racing car driver of the same name.) Barney just loves lizards and you can see some of his images of these amazing creatures here: http://www.lizardsandlandscapes.com/ The various Collared Lizards are absolutely stunning creatures. Click on Galleries to access the lizard (and the rattlesnake) photos. To see Barney's excellent images from the Galapagos trip, click here: http://www.lizardsandlandscapes.com/Galapagos_Picture_Gallery.html I am extremely envious of his Swallow-tailed Gull, his Galapagos Giant Tortoise, and his Galapagos Penguin images. Galapagos Trip #2: June 28-July 8, 2006. (Dates firm/trip tentative as noted above). The cost of this trip will be $4499.00 per person based on double occupancy. This trip is at priced at least $1,000 less than similar trips offered by Zegrahm ($5700) and Linblad ($5500) and neither of those trips have me as the leader. An $800.00 per person deposit is required at the time of booking. The deposit is non-refundable unless the trip does not run in which case your deposit will be cheerfully refunded in full. Final payment is due on February 1, 2006. The trip fees will be non refundable after that unless your spot is resold. To reserve a spot now, Call Janie Bullard 888-419-6677 or e-mail her at Janie@Distinctive-Journeys.com. If you leave a phone message, be sure to state the following: "I wish to send you a deposit for the first 2006 Galapagos trip, June 28-July 8, 2006 with Arthur Morris. Please save a spot for me." We already have deposits for at least 8 of the fourteen slots. Canon EF 600mm f/4L IS lens with 1.4X II TC and EOS 1Ds Mark II. ISO 400. Evaluative metering -2/3 stops set manually: 1/1250 sec. at f/8. Yes Virginia, I now own and use the Mark II 1Ds. With its amazing 16 megapixel files you can crop to the equivalent of the 1.3X of the Mark II 1D and still have 28% more pixels, and those pixels are of higher quality. I will share more on this amazing camera with you in future Bulletins. When making landscape images with short or intermediate tripod-mounted telephoto lenses (which I do often at Bosque) I recommend that Canon folks use Custom Function 4-3 that transfers AF function from the shutter button to the star button. By doing this you do not have to hold the shutter button down half-way. In addition, you get real time exposure. I advise folks to simply focus on the first row of birds in a bird-scape by pressing and then releasing the star button. The focus will not change until you press the star button again or focus manually. I recommend using the central sensor only and leaving AF in AI Servo Mode so that if the birds take flight, you can push and hold the star button to get active AI Servo AF. I knew that some Nikon bodies offered this option but had no idea how to access it. There were two new D2X users with us and neither of them knew either... One of them, Jock Voelke--a practically last-minute registrant-- was kind enough to forward the information below. 7. if you choose AF-ON only you have to use the AF-ON button on the back upper right of the camera to auto focus, this deactivates the shutter button focus. Do note that Nikon users are welcome on all IPTs and that we send about 100% of them home happy. Canon EF 600mm f/4 L IS lens and EOS 1Dn Mark II. ISO 400. Evaluative metering +2/3 stops: 1/320 sec. at f/4. Fill flash with Better Beamer at -1 stop. Robert O'Toole was kind enough to leave his CPS loaner EOS Mark II 1Dn with me when he left. I loved the larger LCD on the back of the camera and the larger buffer. Here, I was lucky that 45 Point AFPS AF focused on the drake in the middle!